The Chuck Cowdery Blog: The Rufus M. Rose House Is For Sale. 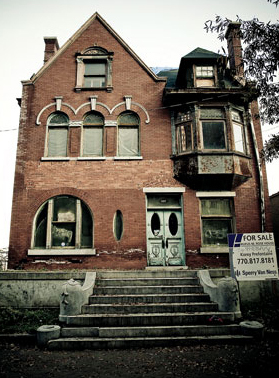 Once valued at more than a million dollars, it was recently foreclosed and the bank has it listed for $315,000. They’ll probably take less. Its significance, for our purposes, is that Rufus Mathewson Rose founded the original Four Roses Distillery. That claim is not universally accepted, however, as the present owners of Four Roses Bourbon only acknowledge its history back to Paul Jones, who brought the name from Atlanta to Louisville in 1884. The Jones family built Four Roses Bourbon into a major national brand. For reasons unknown, Jones and his successors never acknowledged the Rose family, although they did claim that the Four Roses name was in use in Georgia as early as the 1860s. As the Rose family’s version is told, the original "Four Roses" were Rufus Rose (1836-1910), his brother and business partner, and their respective sons who were also in the business. Four guys named Rose, hence "Four Roses." The R. M. Rose & Co. Distillery was located twelve miles northwest of downtown, on Stillhouse Road in Vinings, Georgia. The Roses sold their whiskey through a chain of Atlanta-area stores that also sold tobacco. Since whiskey brands, as such, were only just coming into existence in the last few decades of the 19th century, it’s possible Jones acquired some kind of rights from the Roses but it was Jones, not they, who first registered Four Roses as a national trademark in 1888. The “official” (per the City of Atlanta) history of the house says the Roses were still making Four Roses Whiskey as late as 1907, when Georgia went dry and they moved to Tennessee, after which their trail grows cold. That claim, obviously, is inconsistent with the Paul Jones Company timeline. The house is prominently located on Peachtree Street in downtown Atlanta and is one of the few single family homes left in that neighborhood. It has five bedrooms, three baths, and 5,700 sq. ft. It is right next door to a Gladys Knight Chicken and Waffles location. If you want to find the listing, search the street address: 537 Peachtree St NE, Atlanta, GA 30308. 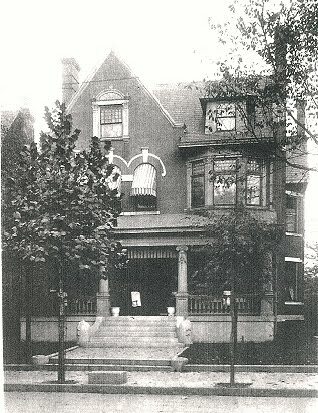 According to the Atlanta Preservation Center, the 1901 house was designed by Atlanta architect Emil Charles Seitz Sr., in the Queen Anne style. For more than 50 years (1945-1998), it was the home of the Atlanta Museum, a privately-owned museum established by James H. Elliott, Sr. to display his eclectic collection, which included furniture belonging to Margaret Mitchell and a Japanese Zero war plane. It was the headquarters of the Atlanta Preservation Center from 1999 through 2001. It is listed in the National Register of Historic Places and designated as an Atlanta Landmark Building. The previous owner’s restoration plans fell through and Central Atlanta Progress, a private nonprofit community development organization, estimates it will take about $500,000 to whip it into shape as an office building or restaurant. A better idea would be for Four Roses to buy it, restore it to its original glory, and operate it as a tourist attraction, which would also tastefully promote Four Roses Bourbon. If you drink Four Roses Bourbon and think this is a good idea you might want to suggest it to them. They’d love to hear from you. You are correct this house is the last of that era left on that stretch of Peachtree. That particular part of Peachtree between Midtown and Downtown is near Georgia Tech and the house sits across from Emory Midtown Hospital. Peachtree north of this area has revitalized. To the south sits downtown. If something could be done with this house and a couple of surrounding buildings, the ongoing uplifting of Atlanta's landmark road from just north of Underground all the way out to Buckhead would be complete. It would be even better if Four Roses bourbon helped make it happen.